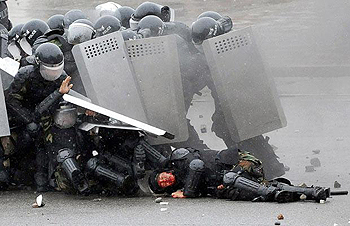 A Kyrgyz police officer injured during a riot. Until recently, Kyrgyzstan—a landlocked country with an 80 percent Muslim population—was one of the safest countries in Central Asia. However, its neighbor Uzbekistan, which has a 90 percent Muslim population, has suffered from many problems, such as religious extremism. These have created a volatile atmosphere in the country. Consequently, many Uzbek nationals have sought refuge in the safer countries of Central Asia, like Kyrgyzstan. But when there is tension in their new host countries, such as when Kyrgyzstan's President Kurmanbek Bakiyev was forced out of office in April after bloody anti-government protests in the capital of Bishkek, the Uzbek minority has found itself a convenient scapegoat for the ensuing unrest. The recent volatility surrounding the ousting of the Kyrgyz president triggered knee-jerk violence against the Uzbeks, who were accused of interfering in the country's internal political conflict. According to various estimates, the recent violence in June has left at least 2,000 Uzbeks dead and some 375,000 displaced, as well as hundreds of Uzbek businesses and homes looted and burned to the ground. Some believe that this violence was instigated and perpetrated by organized armed groups. As a result, despite the peaceful vote on a constitutional referendum at the end of June, making the country a parliamentary democracy, many fear that even more violence—possibly on the level of another Rwanda—could occur. In light of this possibility, the international community may imagine it is faced with either the option of risking getting embroiled in a military quagmire, or feeling guilty about doing nothing. However, there is another option. There is a dream that Mahatma Gandhi almost put into practice: the Shanti Sena, or a "peace army," which could prove useful in this situation. The idea behind the Shanti Sena was that trained nonviolent volunteers would live in a place with conflict long enough to gain the confidence of the locals as a neutral third party. They would then provide services to promote peace in times of tension: abating dangerous rumors and misconceptions, accompanying vulnerable persons under threat, mediating when asked and—if need be—interposing themselves between conflicting parties if it was too late to defuse tensions. This practice is more commonly known as "unarmed civilian peacekeeping" and it has had tremendous success, despite the fact that it is largely ignored by mainstream media. In 1981, the Shanti Sena concept inspired the formation of Peace Brigades International (PBI). PBI's main focus became the protective accompaniment of threatened human rights workers, especially in Central America where their presence facilitated several peace-building initiatives and allowed human rights organizations to keep operating despite death threats. Eventually, in accordance with its motto, PBI "made a space for peace." Taking their cue from PBI, Americans Mel Duncan and David Hartsough decided to dedicate their lives to expanding and professionalizing other such peace teams. They helped found Nonviolent Peaceforce in 2002, a global peacekeeping organization composed of trained civilians from around the world who apply proven nonviolent strategies like protective accompaniment and rumor abatement in areas with conflict. Nonviolent Peaceforce has also helped create space for local peacemakers to carry out their work in areas like Sri Lanka, the Philippines and southern Sudan, and they hope to expand to other areas in need. Kyrgyzstan could benefit from this kind of a neutral, nonviolent third party presence to teach and demonstrate to the local population that ethnic violence does not solve anything—but nonviolence just might. In Kyrgyzstan in particular, peace armies could act as a protective force, escorting and defending targeted minorities like the Uzbeks. Nonviolent Peaceforce has already sent an exploratory team to the southern Caucasus, where there have been multiple interstate and ethnic conflicts in the recent past. With an invitation from the new Kyrgyz government, and international support and funding, Nonviolent Peaceforce could get to work in southern Kyrgyzstan and help the country transition—peacefully—into a parliamentary democracy. Every time nonviolence has been used correctly it has been a brilliant success—and almost every time, barely anyone notices. Until the media catch on, it's up to the public to get informed about unarmed civilian peacekeeping. For if we know of no alternative, we may continue to flounder in the old dilemma of violence or inaction. Michael Nagler is professor emeritus at University of California, Berkeley, founder of the Metta Center for Nonviolence, and author of the award-winning book, The Search for a Nonviolent Future. S. Francesca Po served in the Central Asia region of the Peace Corps from 2006 until 2008 and currently teaches religious studies at the University of San Francisco and St. Joseph Notre Dame High School. This article was written for the Common Ground News Service: www.commongroundnews.org.